Is there a standardized way of transforming the ratings of any of the major ratings agencies (S&P, Moody's, Fitch) to a numerical value. Ideally, it might be possible to create a similar scale for all of them. I just found some academic papers, which just assigned numerical values, i.e. 1 for AAA and 22 for D. Just interested if there are conventions on how to convert the ratings. Additionally, it would help comparing the impact of ratings in empirical studies. I found some documents by ESMA, which are outlining their mappings approach. Mapping ordinal data to interval data is arbitrarily. 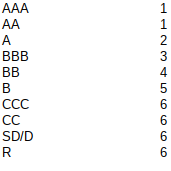 The ranking of rating agencies is ordinal data, so only comparing operators > or < can be applied. The data can be sorted and as a central tendency, you can calculate the median. The main aspect of ordinal data is that it allows for rank order but it does not allow for the relative degree of difference between them. E.g. the difference between the rankings AAA and AA may not equal the difference between BBB and BB. Your figure shows this explicitly by assigning different rankings the same (arbitrary) numerical value. Comparing the impact of ratings is still possible however, by applying ordinal regression instead of a linear regression, if the dependent variable is in ordinal data. Commonly used models for this are ordered logit or ordered probit models. If the independent variable is in ordinal data, you may use dummy variables to control for their impact in a regression. One possible approach to mapping these ordinal measures into cardinal measures is to use something like average default probabilities of each of the ratings over the period in question. One can perhaps enhance the mapping by using transition probabilities of each rating into the other ratings over the period to take into account the distribution of ratings for each entity. Not the answer you're looking for? Browse other questions tagged fixed-income finance credit-ratings or ask your own question. Do bond credit ratings suffer from “ratings inflation”? is there a mapping from Altman Z-score for private companies to bond ratings or probability of default? Time series of European sovereign credit ratings by the Big Three? Who pays for sovereign ratings?